Printed from http://www.bodytalksystem.com//learn/news/article.cfm?id=905 on Apr 22, 2019. "You can leave any time. You don't have to stay,"
It was th e third day of BodyTalk Fundamentals, and we were possibly in grave danger. Only two days before on February 14th, only thirty miles from the hotel, Mount Kelud had erupted, sending a huge plume of ash and sand ten miles into the air. Most airports in Java were grounded and surface travel was restricted. More than 76,000 people fled their homes. A few were killed from collapsing buildings and many were injured. Mt Kelud is just one of nearly 130 active volcanoes in the world's fourth most populous country, locals call it the "Ring of Fire", and we happened to be in the middle of it all. 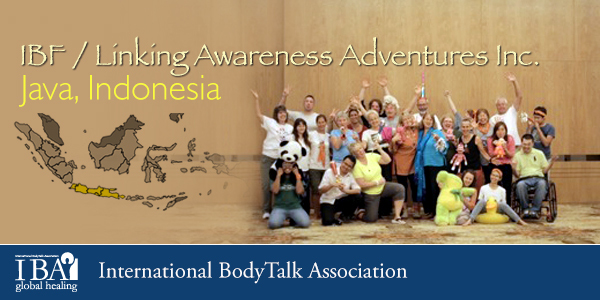 Our group from Canada, USA, Japan, Germany, Singapore, and Indonesia, had come to experience Loesje's magical brand of BodyTalk Fundamentals and Access. Some of us were old-timers. Some were brand spanking new. As we gathered in the grand ballroom of the Harris Hotel and Conventions in Malang, Java, Indonesia, Sr. CBI Loesje Jacob solemnly told the thirty or so of us "You can leave any time. You don't have to stay." As an instructor, I was invited to assist Loesje in teaching her five-day class. 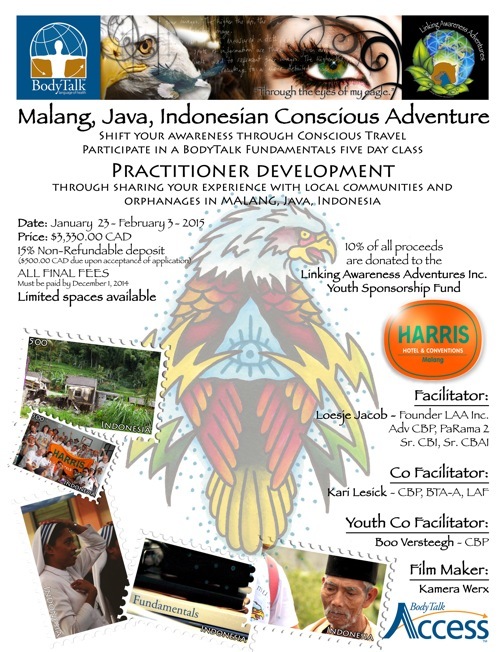 Sponsored participants from Indonesia had experienced the huge healing benefits from experiencing BodyTalk when Loesje was in Malang the year before. They wanted to learn BodyTalk for themselves so they could share it with others in their own country. We all felt privileged to be there and part of such a talented, diverse group. During our five days of classes, we had such a wonderful range of participants. We had veterinarians, nurses, psychologists, massage therapists, animal trainers, business people and pretty much basic extraordinary people. When you get a group of people like that together, with the intention of bringing balance and harmony to the planet and all living things that make up that planet, it is kind of a no-brainer that we all made the decision to stay put, dig in, and get to work. After all, it only made sense that the earth would erupt like a broken sore to get our attention that this was big work we were doing. And the brilliance of BodyTalk is that we knew the smallest of links to the most seemingly obscure foci could make a big difference. We also knew that the biggest shifts to take place would be within ourselves, causing core parts to melt and overflow. As the ashes were lightly falling on the outdoor tables where we ate and worked, it felt to me like we collectively made an unspoken pact to be like the eye of the storm and hold space for whatever the earth wanted to tell us. We felt honored and grateful to be invited back again in 2014 by the Harris Hotel and Conventions, a 4+ star hotel. Loesje had been working with General Manager, Stylianos Koureas for seven years, first in Batam, Indonesia, and now here in Malang, Java. 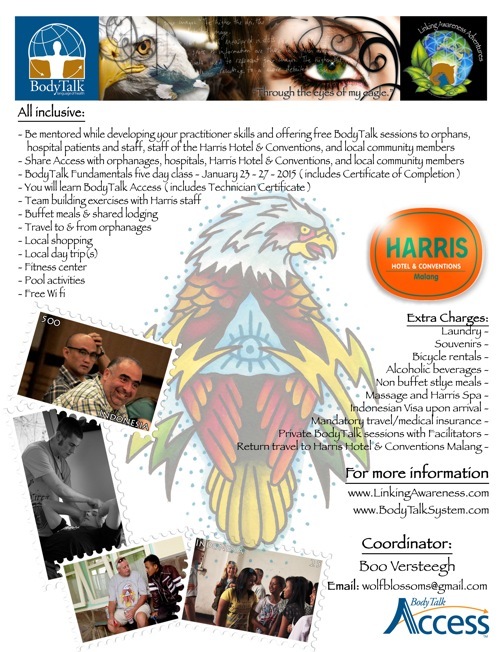 Harris Hotels and Conventions have been sponsoring Loesje's BodyTalk Access and Linking Awareness Youth Teams with accommodation, food, and project logistics since 2008. They have experienced the benefits of BodyTalk sessions from the corporate to the individual level since Loesje did her first matrix session after first meeting Stylianos in 2008. And so it was that Loesje sponsored the entire two-week project fees while Harris Hotel and Conventions covered the accommodations for twenty-four participants from around the globe. One of the important aspects of this project was the opportunity to do sessions for staff and owners of the hotel, as well as interested locals. As the word spread, Loesje assigned participating practitioners to fulfill the increasing requests for sessions. Consequently we worked with some of the bigger players in the East Java business, banking, and medical world. Doctor of Internal Medicine, Eric Bahardi, was so intrigued he invited the entire group to his house for dinner, as well as to us to work in his hospital at our earliest convenience. On completion of the Fundamentals class, new graduates and old hands alike, we were eager to experience BodyTalk at a different level. And here I have to give a shout-out to all those who came. Many of them left their jobs, or quit their jobs, spent 100's of dollars and chose to be far away from technology, comfort, family and friends for weeks at a time to be part of this journey. We knew we were in good hands with Loesje. Part of her brilliance is being in the moment and being open to the opportunities that show up. She has a second sense, (or is it a sixth sense?) about the places she goes and what is called for. Things just open up for her to allow the opportunities to show themselves. Given the state of emergency and the fast moving circumstances, doors that were open in one moment would shut, and others never anticipated, would "miraculously" open! I don't think there was an aspect of BodyTalk we didn't cover in those five or six days after the class. For example, we didn't originally plan on working at Sumber Sentosa Hospital, but the work we did with Dr. Eric, prompted him to invite us to see what we could do. The hospital seemed like a true representation of a community hospital. Very basic needs were met there, and it spoke so highly to the dedication of those that are there every day. We received permission to work on any patient that would be open to it, and not one turned us down! Dr. Eric and the nurses took us to each of the rooms and explained the basic reasons that the patients were in the hospital ie: diabetes, heart, liver, tumors, stomach, stroke, asthma, cancer, and a variety of other maladies found in a general hospital. Doctor Eric remarked with glee at one point, "I have five people on my waiting list, and you have nine! So, who is the doctor now?" Once the patients experienced the sessions, they could literally feel a difference immediately and asked for more. The line up began to grow as locals ran home to get their family members. BodyTalk results were experienced within hours and significant improvement was reported two to three days later. In fact, we were invited back again to follow up previous sessions and to serve in an inpatient and outpatient clinical setting. For me, as a participant and an observer, I couldn't help but be overwhelmed at the insightful and professional work that was done, especially by the new students. By the same token, Adv CBP Ellen Hall, a registered nurse who was in our group, was completely overjoyed to be able, at last, to marry her two passions of nursing and BodyTalk into an effective course of action for struggling patients. Over the course of two days at the hospital, we did a total of over 250 sessions between us. Now that's intense practice! What I loved about the Indonesian people is their kindness and sensitivity to energy. We also had the opportunity to work in two orphanages. Malang is the second largest city in East Java, handling problems faced by around 8,800 children, consisting of orphans, the poor, or poor children with disabilities. One of the biggest concerns of officials is the need to empower these children to eventually leave the orphanages and become self sufficient and healthy. Teaching the children and staff ways to balance their own Body/Mind seems like a huge step in that direction. Loesje and Stylianos had agreed years ago, that for the orphanages of Indonesia it was more appropriate not to give "things" or to launch a "rescue" mission. BodyTalk was a perfect fit. We don't "fix" things. We teach five basic BodyTalk Access techniques that children and staff can do for themselves and each other. This cannot be taken away, or sold out the back door. This makes them more self-reliant for their general health and well-being. The first orphanage was fairly small, about 100 children. We divided into small groups, and while Loesje taught them Access, we facilitated the small groups. The next orphanage was larger. There were around 800 people counting the 580 orphans. The children sang the most beautiful songs to us. I don't know what I was expecting, but they seemed cared for and cared about. I loved the clever and fun way Loesje taught them Access, and I loved how each of the small group leaders added their own individuality and heart into the practice. After we taught the techniques, we offered advanced sessions to anyone interested. It was significant to see how many of the staff wanted individual sessions or wanted us to work on children with challenges. I lost count of the total number of sessions we did collectively, but as I type this, it comes to me that if there are 8,800 orphans in Malang and we taught in two orphanages that represented 900 people, then that is roughly 10% of the whole group. What a ripple effect that will turn out to be! And last but not least, we were invited to go up the mountain to one of the villages extremely affected by the volcano. Harris Hotel and its owners are tremendously committed to contributing to the communities around them. They had already planned to donate large amounts of goods to those who had fled their homes. They asked if we would we be open to doing some work in the affected areas. We were just waiting for the chance, and so they provided buses to make the 4-hour trip happen. What I didn't know before is that sometimes volcanic eruptions can cause big storms and massive flooding. Ash particles in the atmosphere increase precipitation, and tons of volcanic sand not only covers land and buildings, but can block waterways. When these blockages give way, mountainsides can collapse and roads can be washed away. Plus, we weren't sure how much we could trust Mt. Kelud to behave while we were in the path of the destruction. No mirror to sessions there at all ... l0l! Again we were given the choice "You can leave any time. You don't have to stay." Personally, I just had such a feeling of peace that whatever happened. I felt I would be in the right place at the right time and I would be "OK". The ride up the mountain had some of the most beautiful scenery I have ever seen. Rivers, streams, waterfalls, lush foliage, terraced rice fields and sweet little bright-colored villages all along the way. Then things became darker, like a grey snowfall over everything, with piles of ash and sand along the roadside two to four feet high. From our bus we saw flooding rivers, one with a large excavator half buried in the middle, and large chunks of fields carved away. We stopped in a small town to offload relief supplies donated by Harris Hotel and Conventions. Our two buses then headed for the nearest village and we all got out. Loesje and the Harris Hotel staff talked to the villagers and told them we do a kind of healing work and asked if they would they be open to it. A few of them seemed interested, so we all parked ourselves in different parts of the village and pretty much opened up shop for people to come to us if they wanted. As we did sessions, we could feel the response and the excitement grow. People ran down the street to bring their friends and families. Everywhere I looked, one of us was doing a session, tapping out cortices, active memory, switching – whatever priority showed itself, from Access to the most advanced PaRama BodyTalk sessions. We would have stayed for hours more, but there was word of an approaching storm and our hosts were anxious to get us off the mountain. For my part, it was an experience I will never forget. These sweet people were still in the middle of their traumatic experience. They told us of the terror of running from the ashes, of stumbling and falling and trying to find their families. Even a week after it happened, some parents had still not been reunited with their children for safety reasons, and to make their homes habitable again. You could see the terror in their eyes. How could I begin to make a difference in an experience I could only imagine? Then the answer came clearly. Just observe the session, ask priorities, find the links, and tap it out, but mostly open my HEART to theirs. Find THAT link and I have found it all. Stand as witness. I SEE YOU. Like the flooding rivers below, we flow into each other and WE ARE ONE. All of this makes me proud to be a part of the IBA. I felt held by all who have worked with me, taught me, and shared with me since I took my first class from Marita Roussey in 2002. I'm pretty sure I taught the first Access class up in the Andes in the remote villages of Peru in 2005. The beauty of BodyTalk has no borders. This journey brought me full circle in so many ways, and I am so grateful to have had this opportunity with Loesje, her miracle workers, Boo, Andre, and Kari, and many other people that will be in my heart forever. I haven't even talked about the Elephants in Sumatra and the Orangutans in Borneo. The purity and profoundness of doing BodyTalk in those circumstances, coupled with Loesje's Linking Awareness is a story for another day.